Dr Upendra Singh, MBBS, MD is the best General Physician in Gorakhpur serving patients through his excellent knowledge and skills. Having completed his MBBS and MD, he has been practicing in his hospital Spandan Hospital. Spandan Hospital is located at Rail Vihar Chauk, Rapti Nagar Phase, Chargawa in Gorakhpur. He is specialized in treating diseases and conditions like BP, Sugar, allergy, chromosomal abnormality, dengue, jaundice, fever, flu, cold, jaundice and heart related disease etc. 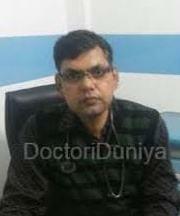 You can book an online appointment with Dr Upendra Singh, best General Physician in Gorakhpur through Doctoriduniya.com. No articles written by Dr. Upendra Singh.